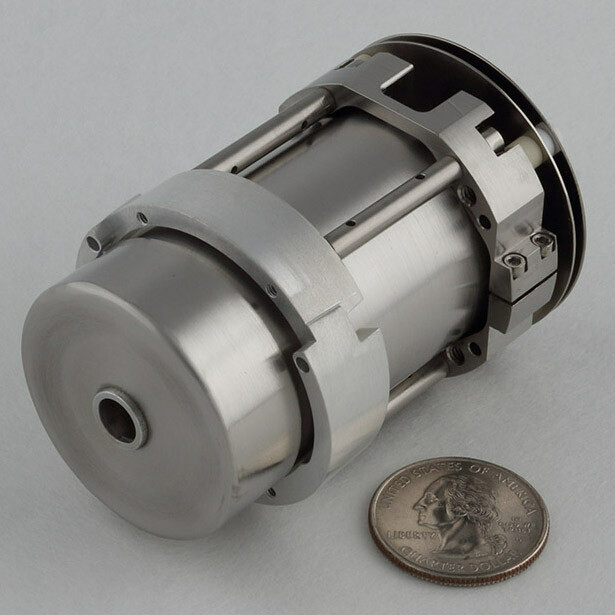 Atom sources - AOSense, Inc.
AOSense has developed novel atom trapping and vacuum hardware in response to the challenging size, weight, and power specifications of our customers. Our components are engineered to be considerably smaller than standard laboratory hardware, consuming little or no electrical power and requiring no water cooling. Creating bright atomic beams starts at the oven. 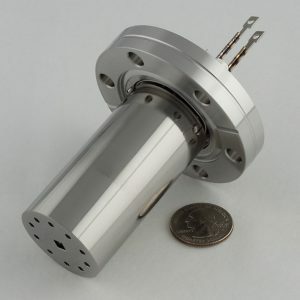 Our compact atomic beam oven (shown below on a 2.75″ CF flange) is designed to provide a high flux of atoms with low power consumption and no water cooling. The oven has exceptionally low outgassing at elevated temperatures (6×10-8 Torr-L/s at 400 °C) while generating fluxes greater than 1×1013 atoms/s with only 4 W of input power. The oven can hold many grams of material. AOSense’s compact, permanent magnet Zeeman slower (US Patent 8,710,428 B1) requires no electrical power or cooling water. 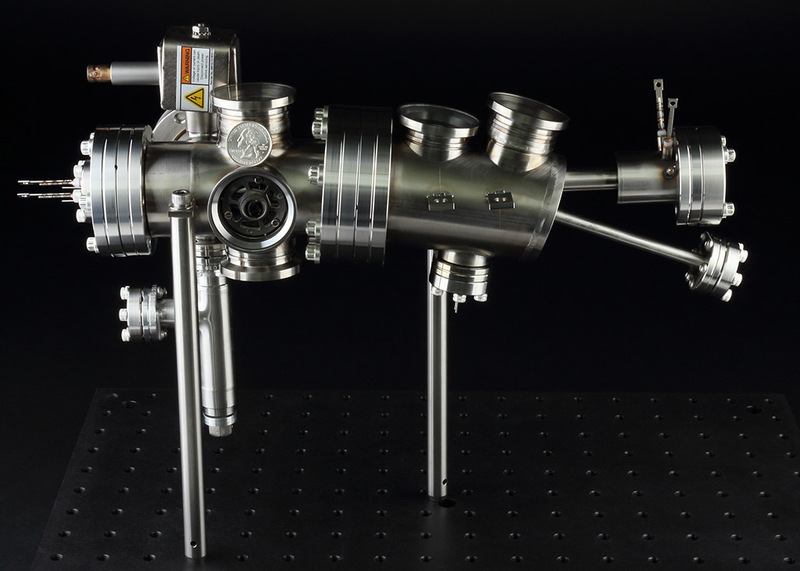 The slower assembly (shown below next to a US quarter for scale) includes permanent magnets, a unibody frame, transverse cooling optics, a magnetic shield, two layers of radiative shielding for the input face, and a mounting clamp. The clamp references the magnetic and thermal shielding to the unibody frame and provides mounting points for holding the slower inside a vacuum chamber. Our miniature atomic beam chambers (1-2 L) feature in-vacuum optics and achieve baseline pressures below 1×10-10 Torr with an AOSense oven, Zeeman slower, hot window, and transverse cooling / trapping assembly installed. Please contact us to discuss your applications.